What do you think of this VERY pink stairs? Wow! I’m also totally in love with it! Perfect for the ascent to a little princesses bedroom! Hey, what a statement. I’m not usually into pink. But this one is fabulous. I do actually have stairs very much like this….and they need painting. Somehow I don’t think I will be brave enough to paint them this colour. At the moment they are a camel colour. Maybe a brick red instead? i love that cute little dollhouse even more! 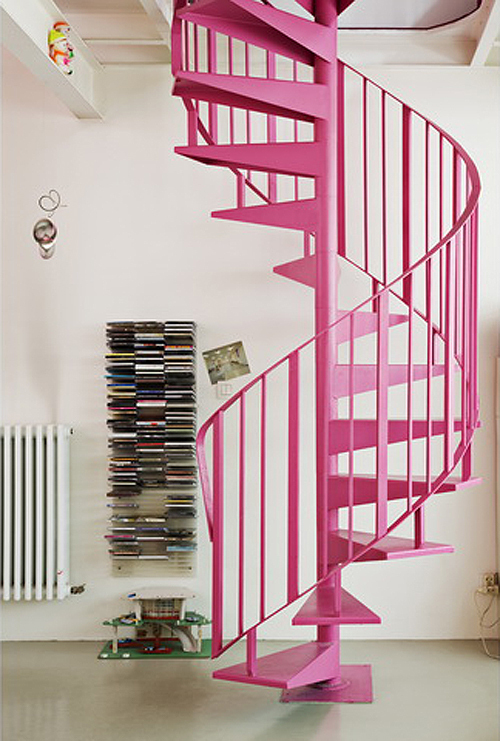 WOW…this has to be the coolest stairs I’ve ever seen….for a GIRLY-girl apt. though!